Baby Dragon is our Throwback for Thursday, and a fan favorite. Cute, little dragon with low ATK/DEF, and is a vanilla. Nothing going for this little one, but back in the day it was needed with Time Wizard for Thousand Dragon, and thanks to the show, people loved it. Alligator Sword Dragon uses Baby Dragon as well, and is a better monster than Thousand Dragon. A nice look back, and the card makes me smile, but there isn’t really much to the card. So Throwback Thursday this week is looking at a baby, Baby Dragon. Baby Dragon is a Level 3 WIND Dragon with 1200 ATK and 700 DEF. WIND is under supported as an attribute, Dragon is heavily supported as a type, and the stats are not really helpful. Baby Dragon is a Dragon gifted with an untapped power. Yeah, can we tap into that power soon? 1200 ATK isn’t that strong. Sure you can use this with Rescue Rabbit for a Rank 3 XYZ, but there are better Level 3 Dragons and WINDs that are vanillas I am sure. Unless something comes that requires a WIND Dragon, which I am highly doubtful of, Rescue Rabbit has much better options than Baby Dragon. Art: 4/5 At least it is cute. Baby Dragon…wow, what a throwback. I mean, a mother would have to have a baby, by definition, so I suppose that’s logical. Though Thousand Dragon would be the big brother, or even father, perhaps, so that kind of takes away from the mother theme. Plus we’re stuck on a vanilla card here, even if it was iconic of Joey Wheeler in the Duelist Kingdom days. Cute, nostalgic, probably the most fitting card to the theme of the week. This card is terrible. Bad stats. No effect. Not useful for anything. 1/5. I really only wanted to review this card because it reminds me of Pokemon. It looks like a Baby Dragonite (note: not at all like Dratini). 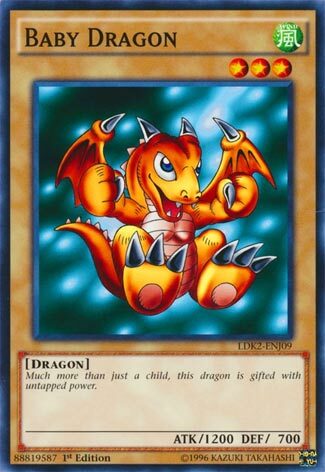 In any case Baby Dragon is a Level 3 Wind Dragon-type monster with 1200 Atk and 700 Def. That’s it. Yes it can be fused with other stuff to make bigger stuff, but so can King of the Swamp which has a useful effect. This is just a throwback because everyone has a mother, but mother’s had babies. Other baby cards weren’t nearly as cute. Who knows? If Buster Blader can get support so too can Baby Dragon. I mean, even Ojama’s still get support.